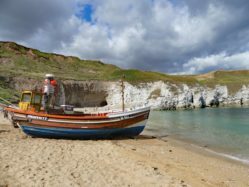 If you’re staying on Haven’s Thornwick Bay, Flamborough Head is a MUST visit. It’s just a 10 minute drive away or 45 minutes walk. Flamborough Head is a promontory, 8 miles long on the Yorkshire coast of England, between the Filey and Bridlington bays of the North Sea. It is a chalk headland, with sheer white cliffs. The cliff top has two standing lighthouse towers, the oldest dating from 1669 and Flamborough Head Lighthouse built in 1806. The older lighthouse was designated a Grade II* listed building in 1952 and is now recorded in the National Heritage List for England, maintained by Historic England. The cliffs provide nesting sites for many thousands of seabirds, and are of international significance for their geology. Marked by a stretch of rugged white cliffs surrounding a small village, Flamborough Head is an outdoor lover’s paradise. The coastline is a great base for bird watching, hiking along windswept paths and sea canoeing around the bay – but only for the experienced outdoor pursuits enthusiast! With a scenic nature reserve and two ancient lighthouses nearby, this Special Area of Conservation is a haven for anyone looking to explore the Yorkshire Coast at its most wild and untamed. If you like your bird watching, Flamborough head is an ideal location to explore. Seabirds such as northern gannets, kittiwakes and Atlantic puffins breed abundantly on the cliffs. Bempton Cliffs, on the north side of the headland, has an RSPB reserve and visitor centre. Because it projects into the sea, Flamborough Head attracts many migrant birds in autumn, and is a key point for observing passing seabirds. When the wind is in the east, many birders watch for seabirds from below the lighthouse, or later in the autumn comb the hedges and valleys for landbird migrants. Flamborough Head has a bird observatory. If you’d like to take a look at our selection on Thornwick Bay, you can do so by clicking here. Thank you to one of our lovely guests (Amanda Hodgson) who took these stunning photos during her holiday at Thornwick Bay. They really capture just how magnificent this landmark is.